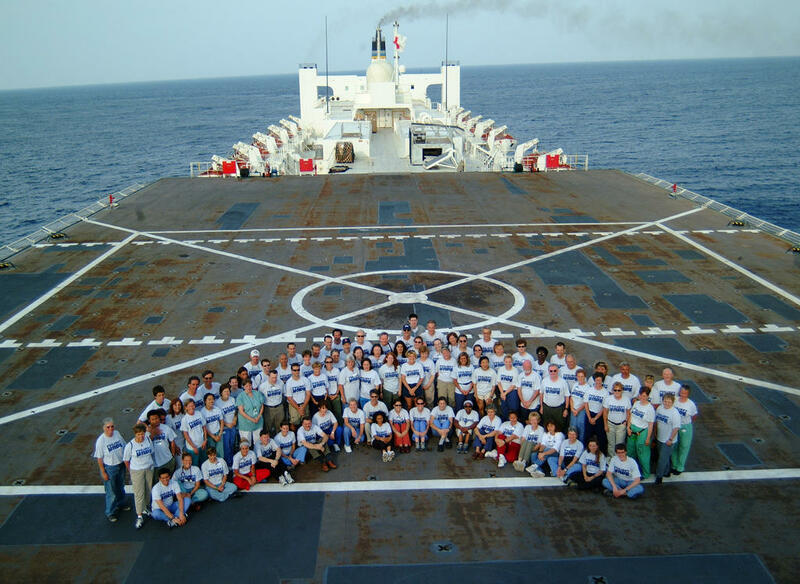 This is a speech from Tamalia - one of the translators aboard the USNS Mercy as the second wave of Project Hope Volunteers were departing, March 2005. She works as a curator for the Indonesian National Museum in Jakarta. "I think that it was Sir Arthur Chesterfield who said something along the lines that the human species is happiest when it is of service to others. Well, I do not think that I shall ever be on a happier ship than this one. You, doctors and nurses who have worked on this ship treating the wounded Acehnese tsunami survivors are extremely special people with an enormous compassion and empathy for others, especially for those who are suffering. You are truly good people - if you were not you would never have volunteered to be on this ship and I think that when a large group of truly good and caring people are collected together in one place like this - it creates a certain energy of its own which has far reaching effects. I do not know if you are aware of it but when I left Jakarta to join the Mercy the front page article of one the newspapers in Jakarta was about how Indonesian public opinion towards America was taking a major turn. This happened after Indonesians started reading about and watching via the television the thousands of mercy missions flown by the helicopters of the USNS Abraham Lincoln off the coast of Aceh. Daily the helicopters dropped food, water and medical supplies to the survivors of the tsunami whom my government would never have been able to reach in time after the enormous destruction of roads, bridges and communications by the tsunami. And later Indonesians witnessed the compassion of the doctors and nurses of the USNS Mercy as they treated over 19,500 Acehnese patients and performed over 250 operations. I do not think that any other government in the world would have been able to provide such an enormous quantity of aid so rapidly because no other government is equipped with the enormous war machine that the United States has and what happened is that in the last three months we have watched that great war machine being used for something totally different and in a way that was completely foreign to us. It was being used to save and heal thousands of lives and quite frankly, at first we Indonesians watched with suspicion and then in puzzlement but finally with gratitude and fondness. During the last days before the departure of the ship many of the patients were returned to shore to finish their final recuperation at Indonesian hospitals many of which are just starting to fully function again. It was a very emotional time for me as I have had to translate for many of the patients and doctors and nurses as they bid each other farewell. Over and over again this is what the patients have been saying, "I do not know how to thank you. I cannot repay you for what you have done. I have nothing with which to repay you. It is only God who will be able to repay you for what you have done..."
It is one thing to heal people and to give them medical aid but I think that there is another element in all this that you may not be aware of. These people that you have been treating are the poorest of the poor. They eat chicken or meat perhaps once a year. If they eat fish twice a week that is already good. Normally, their meal will be a plate of rice with some chilly peppers and a bit of swamp spinach or other vegetable. There has been an insurgency going on here for many years. The military comes and extorts money out of them and burns their houses. Then the separatists come and kidnap them, extort money out of them and burn their houses. They are frequently caught in the cross-fire between the military and the separatists and it doesn't matter because they are just garbage - people of no value. If they go to a hospital for help they are not kept waiting for hours - they are sometimes kept waiting for days and they are treated with arrogance and without care. Indifference is often the best they can expect. And then they came here. Here you not only healed their bodies but you treated them with such gentleness, such compassion and such great courtesy. For the first time in their lives they were treated as human beings who have worth. 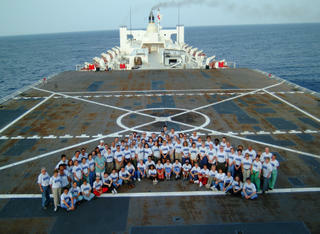 You see a man who has lost an arm, a patient who has lost a leg and yet when they leave the ship they are all smiling. The joy in them is overwhelming. They are perhaps happier than they have ever been in their lives because for the first time they are aware of their worth as people - that their thoughts and feelings and lives count. When they leave here they know that they are valuable. They leave with self-esteem. This is something very special and very rare that you have given them. In Indonesia the words for "thank you" are "terima kasih" which if you translate them literally mean "accept love" for what is it to give someone thanks other than to gave them a part of your love? So allow me on behalf of my country and my people to express to you our gratitude and to give you our love."